I was surprised to recently stumble across two fairly newish books so clearly inspired by The House That Jack Built. Each of them tells the story of a chain reaction, where one misfortune leads to more disaster, until finally things are set to rights. And of course, there are plenty of repeated phrases, lending a bouncy, rhyming sense of fun. 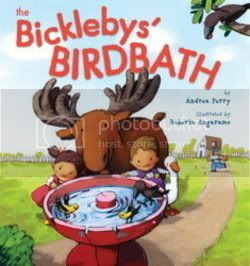 In this story, calamity befalls a mailman who falls in the birdbath. Line by repeating line, we get the cause of each effect, which finally traces back to a little round-faced apple-cheeked girl, with tiny baby feet who has accidentally squirted her leaky hose at a flock of curious crows, which caused the scarecrow to fall in the grass, making a boy mowing the grass, sneeze on a bee, who stings the moose that scared the goose that chased the mailman into the birdbath. With the help of the little boy, the goose and the moose, they soon set things right. Amusingly, the endpages feature bees on the front and birds on the verso side. A gentle read appropriate for very young children. 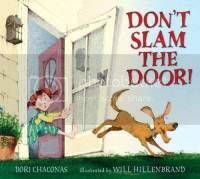 A redhead girl warns readers, "Please don't slam the door! Don't slam that old screen door! A slamming door will wake the cat, and heaven knows, we don't want that, so please don't slam that door!" Naturally, an awake cat will want to play in balls of yarn, which will create knots in the yarn, meaning Pa's socks will end up knitted all lumpy, causing Pa to bump into the honey hive, where panicked bees will sting a bear who will run into the cows in the barn, who will, in turn, run for the safety of the feather bed inside the farmhouse. Luckily, the girl sorts everything out, shivvying everyone back to their proper places, and admonishing the dog as he leaves, "Don't ever slam that door! A slamming door will wake the cat, and heaven knows, we don't want that! We've been through this before!" Watercolor and colored pencil mixed-media illustrations featuring expressive human and animal faces with tiny dot-like eyes are slightly reminiscent of Tomie DePaola. I borrowed these books from the library.